A good way to hide some veggies in the pasta for the picky eaters in your family (kids) (or adults)! I prefer to use whole wheat pasta in my cooking because it has twice the fiber and half the carbs than white pasta. This recipe can be served with any type of protein – chicken, pork, etc. Because this recipe has very few ingredients, I suggest getting the best quality, freshest ingredients possible – it makes all the difference in the taste!!! Many basil pesto recipes contain pine nuts, which I omitted here because I am not a big fan of them. This is my own recipe, so if you something missing, or something is incorrect please let me know. 1. 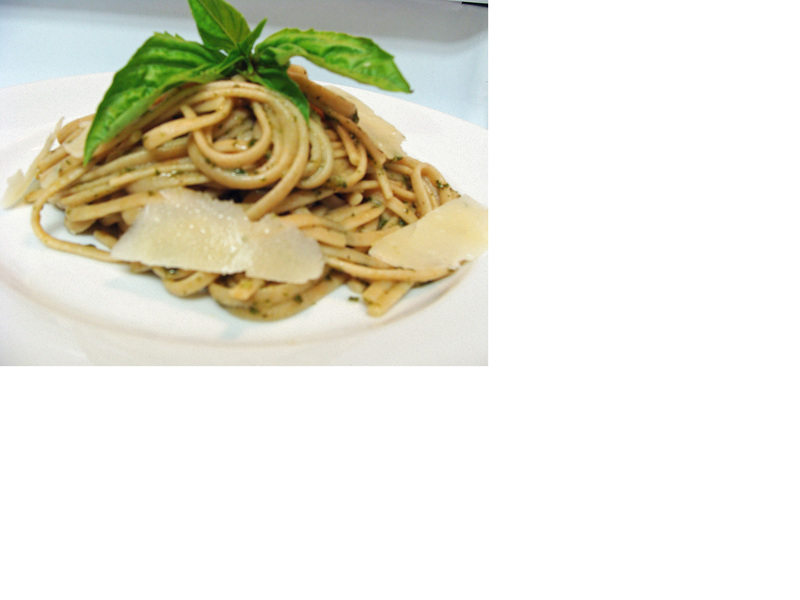 In a food processor, add fresh basil (tear into pieces), whole garlic cloves, grated parmesean cheese. 2. Process all the ingredients until minced. 3. While the food processor is on, add olive oil. You want the consistency to be runny, not dry. Add more/less olive oil if needed. 4. Remove into a small bowl, add a pinch or salt and black pepper. 5. Cover with plastic wrap and refrigerate. 7. Once the pasta is cooked, drain, but leave a few table spoons of the cooking liquid. This will help the pesto sauce to “bind” to the pasta and create a sauce. 8. Add pesto to the hot pasta and mix well. Serve immediately. The pasta can also be served with garlic bread.